The license of an employment agency in Tsuen Wan was cancelled by the Labour Department on Feb 21 for separate cases of overcharging three Filipina applying to be domestic helpers last year. A Labour spokesman identified Jen’s Employment Agency Limited, which has been recruiting Filipino helpers both from Manila and Hong Kong. 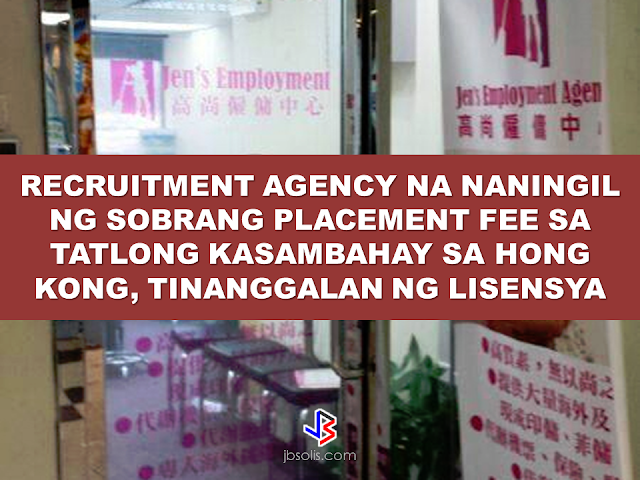 On Sept 1, the said employment agency was convicted and fined $24,000 by Tsuen Wan Court for charging nearly 30 times the allowable commission of $411 at that time to a Filipina job applicant. On Nov 24, they were found guilty for the second time by the same court of overcharging two other helpers.They were again fined $26,000. The second conviction prompt the Labour Department and underwent the process of revoking the agency’s license. The two Pinay HSWs filed complaints of overcharging against the agency with Labour Department’s Employment Agencies Administration. Investigators found their complaints to have sufficient evidence against the agency and filed the charges. Jen’s apparently continued to recruit domestic workers in Manila in spite of being convicted. They even announced on their Facebook page that they will have a job interview to be held at Ermita Manila. The Labour spokesman warned agency operators to comply with the law or they would face prosecution and risk having their licenses revoked or not renewed. “Under the Employment Ordinance, the Commissioner for Labour may refuse to issue or renew or may revoke a license of an EA if the person operating or intending to operate (it) has contravened any provision of Part XII of the Ordinance such as overcharging job-seekers, or if he is considered not a fit and proper person to operate an EA,” he said. Labour also reminded agencies to comply with the Code of Practice for Employment Agencies, promulgated on Jan 13. The EAA will conduct regular and surprise inspections of agencies and issue warning letters to those found violating the Code. The commissioner has all the right to exercise his power under the Employment Ordinance to refuse to issue, to renew, or even to revoke an agency’s license if he is convinced that the licensee concerned is not appropriate to operate an agency. To those who are in Hong Kong that has any inquiries or complaints about unlicensed operation, overcharging job-seekers’ commission by agencies or concerning the Code may be relayed to the EAA at 2115 3667. You may also visit their office at Unit 906, 9/F, One Mong Kok Road Commercial Centre, 1 Mong Kok Road, Kowloon.